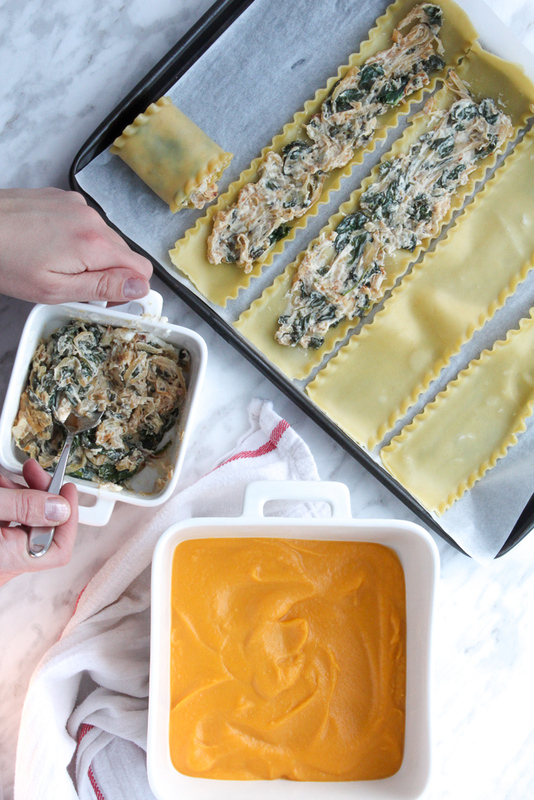 As much as I am exited to tell you about this amazing spinach and goat cheese roll-ups in baked in this creamy butternut squash sauce, I keep postponing writing blog posts. So first read the following lines telling you to pin it for later because you won’t regret it! And then read why food bloggers write and write some more! It’s been controversial lately! 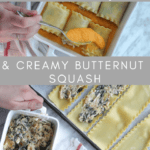 Think the sweetness of caramelized onions, a kick with goat cheese paired with the creaminess of the butternut squash. Flavour explosions! So tasty! This is the recipe that you need on your meatless Monday. I admit, there are a few steps to the recipe but oh-so-worth-it. And actually while the onions cook slowly but surely, you can prepare the creamy butternut squash sauce. It also makes a great freezer meal! Double up the proportions and have one ready to put in the oven! Do as I say not as I do because I should have. I’ll make more soon! Jump to recipe or read? On Instagram, some amazing fellow bloggers on Mia Kouppa, shared some comments made about whether it’s really worth reading through aaaaaaall the blog post! (not sure which social media they saw it on). Why do I choose to chat before sharing the recipe? TASTING: I want you to know how good it is! DETAILS: Depending on the recipe, I want to talk about the process, things to know. FRIENDS: I want to connect with you! Tell me who you are, leave me a comment, tell me if you cook the recipe. STORY: When I read a blog, I love reading some touching, a story behind the recipe. INSPIRATION: I’m chatting away hoping to inspire you! Do you want to cook? Are you motivated to meal plan? Caramelized onions: Heat the olive oil in a pan, put the sliced onions and let it cook slowly about 45 minutes until golden. Keep it on low heat. Add the spinach and cook for 3-4 minutes. Then add the goat cheese. Stir until melted. Set aside. In a hot pan, pour a tablespoon of olive oil, sauté the garlic and add the butternut squash and then the broth. Cook for 30 minutes or until soft. Add the heavy cream. With a hand mixer, purée the butternut squash. Add salt to taste. Set aside. Cook lasagna strips according to the instructions on the box. Al dente would be the best. Preheat the oven at 350C. 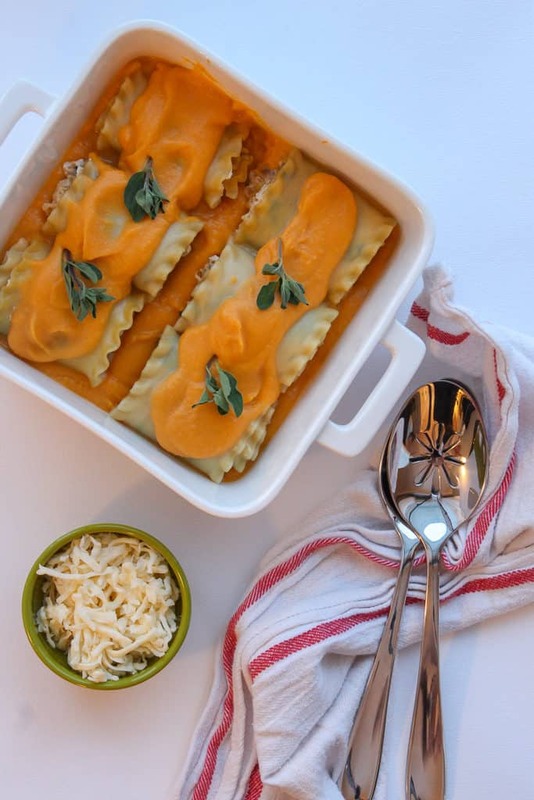 In an oven dish, spread a thick layer of the creamy butternut sauce. Spread the spinach, onion, goat cheese filling onto the pasta strips and roll it. Repeat until done. Place the rolls on the butternut squash sauce. Add more butternut squash sauce on top. Bake in the oven for 20 minutes. Enjoy!